In 1992, the Supreme Court revisited the abortion issue in Casey v. Planned Parenthood. Above, pro-choice activists demonstrate in favor of the 1973 Roe decision. In Casey v. Planned Parenthood (1992), the Supreme Court affirmed the basic ruling of Roe v. Wade that the state is prohibited from banning most abortions. Casey also ruled, however, that states may regulate abortions so as to protect the health of the mother and the life of the fetus, and may outlaw abortions of "viable" fetuses. The abortion debates began in 1973, when the Supreme Court's decision in Roe v. Wade created a political and legal upheaval nationwide. Many states openly defied Roe by passing new laws that prohibited abortions. Other states, such as Pennsylvania, sought to circumvent Roe by imposing procedural hurdles upon women seeking abortions. 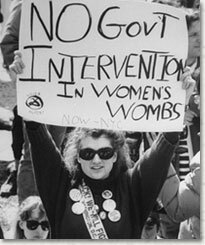 In 1982, Pennsylvania passed the Abortion Control Act, which required women to give "informed consent" before abortions could be performed and imposed a 24-hour waiting period upon women seeking abortions, during which time the women would be provided with information regarding abortions. The act also provided that minors seeking abortions first obtain informed consent from their parents, except in cases of "hardship," in which a court could waive this requirement; and that, except in "medical emergencies," a wife seeking an abortion must inform her husband of her plans prior to the procedure. Finally, the act required that all Pennsylvania abortion clinics report themselves to the state. Planned Parenthood of Southeastern Pennsylvania filed a lawsuit against the state, arguing that the Abortion Control Act violated the Supreme Court's ruling in Roe v. Wade. The Supreme Court, now more ideologically conservative than at the time Roe was decided, took the case for review. In 1992, after much anticipation, the Supreme Court released a lengthy, multipart decision ruling that Roe v. Wade was affirmed but that the bulk of the Pennsylvania law was constitutional nonetheless. Reiterating some of the reasoning in Roe, the Court first declared that a woman's decision to get an abortion implicates important "liberty interests" and "privacy interests" that the Constitution's Due Process Clause protects against state interference. Together, these interests form a "substantive right to privacy" that is protected from state interference in "marriage, procreation, contraception, family relationships, child rearing, and education." This right also protects the abortion decision, the Court again argued, because it implicates equally intimate questions of a woman's personal autonomy, personal sacrifices, emotional and mental health, and fundamental right to define her life. With the constitutional right to an abortion reaffirmed, the Court next reiterated Roe's ruling that, first, states could not ban abortions before the "viability" point (the point at which the fetus is able to sustain life outside the womb), and second, that in no case may states ban abortions that help preserve the life or health of the mother. The Court also rejected parts of Roe, holding that the state can legally pass laws protecting the life and health of the fetus or mother in far broader circumstances. For example, while in Roe the Court had held that the state could not regulate any aspect of abortions performed during the first trimester, the Court now held that states could pass such regulations affecting the first trimester, but only to safeguard a woman's health, not to limit a woman's access to abortions. In another change, the Court now held that, with the advance of life-preserving medicines, the point at which a fetus might become "viable" (the point at which states may constitutionally outlaw abortions) could be slightly before the third trimester. Finally, the Court proclaimed that any regulation that imposes a "substantial obstacle" preventing a woman from obtaining a legal abortion is an "undue burden" that violates the woman's constitutional right to an abortion. With these new rules established, the Court examined the Pennsylvania law and measured its constitutionality. The Court ruled that one of the more controversial provisions of the law, the mandatory 24-hour waiting period, was not an undue burden and was thus constitutional. This provision's purpose, to promote well-considered abortions, was legitimate and only incidentally and slightly limited access to abortions. Next, the Court ruled that the spousal consent provision did constitute an undue burden, because husbands could potentially resort to abuse and obstruction upon learning of their spouses' abortion plans. The Court upheld the remaining portion of the law, including a parental consent provision for minors. Casey v. Planned Parenthood, though less famous than Roe v. Wade, is actually a more important case. In Casey, a more recent Supreme Court not only affirmed Roe's abortion right, but broadened the states authority to regulate it. And yet the decision remains as controversial as Roe, not just politically or morally, but legally. The "undue burden" test is more ambiguous and difficult to apply. With Justices John Roberts and Samuel Alito joining the Supreme Court in its 2005 term, it may revisit the constitutional status of the abortion right that Casey, in part, preserved.